I have been speaking at conferences for over 10 years. I’ve had the opportunity to speak in multiple states to groups consisting of a couple dozen people up to a couple hundred people, and I love doing it. I’ve talked to many people who say public speaking, even just the thought of being up in front of a crowd, intimidates them and they will avoid it if at all possible. When I walk into a room to give a presentation and see the podium, microphone, and usually a white tablecloth on a nearby table with a pitcher of water, I slide into the zone. I feel relaxed and at home. I think it helps that I know people aren’t really coming to see me personally, but to hear the information I have to offer. I feel honored that God has chosen to use me to share what I have learned to help other people. It’s not my great successes that draw people, either. Folks can relate to my struggles, failures, mistakes, and determination to keep trying until I find something that works. I’ve been at this long enough now that I meet people who heard me speak years ago and they seek me out to tell me that they’ve applied what they learned from me and it changed the way they related with their child. As they approached homeschooling in a different way the changes improved not just their school experience but their relationship with their child as well. When people hear my workshops and see me with my grown son, they realize that despite extreme challenges we have survived. Not only that, we are extremely close and enjoy spending time together. That gives people hope. I recently had one mom watch my family for a few minutes and then in an awed voice she said, “You seem happy. After everything you’ve been through, too.” I could tell she was in the trenches of homeschooling a challenging child, and seeing a “veteran” homeschooler gave her hope that she could make it, too. I want to let you in on a secret. I am not a natural optimist, nor am I naturally encouraging. No one has ever described me as “perky”. I have natural gifts, but I have prayed to have the gift of encouragement. God allows me to encourage, but I have to work at keeping my thoughts right. I’m actually pretty pessimistic when left on my own, and I can see the cloud for every silver lining. Big sigh. Can you imagine Eeyore giving workshops? Anyway, I have trained myself and disciplined myself to work at being encouraging. I have had a measure of success in doing so. When I speak to others, I can see when something makes sense to them. I love to see people looking around when I describe a challenge I’ve faced, because so many of us with struggling learners feel isolated and our friends can’t relate to the challenges we face. Then we meet each other and with great relief realize we are not alone and many others are dealing with issues similar to our own. It’s nice to be with people who understand and can relate to our feelings and experiences. Tonight I will be speaking to a home school group for their kick off meeting. As far as I know, I will not know anyone there. There will be a mix of new homeschoolers and those who have been at it for several years. I’m looking forward to this opportunity to encourage and inspire those who, like me, have decided that homeschooling is the best fit for meeting their child’s educational needs. Next Monday, I will be doing a workshop on Adapting Curriculum for Struggling Learners with Heart of the Matter (HOTM) during their online conference. I was thrilled when they asked me to do this. I have presented the workshop many times before, but never just online. I am actually feeling nervous, because I am not strong with the technical aspects of presenting. It didn’t help that during our first practice run my microphone didn’t work, which is the stuff of nightmares for me. The second practice run went o.k. after about five minutes of me freaking out because the microphone was not functioning properly. A substitute microphone seemed to work, but I still feel nervous. It’s weird I know, but I would be completely relaxed speaking to a stadium full of people yet speaking online throws me for a loop. Once I learn how to do this and have some experience, I’ll be thrilled to know how and expand my skill set. My husband, who is naturally optimistic, assures me that “It will be all right.” I’m almost finished putting together a new workshop titled, “So You Think You Can Homeschool?” I can’t wait to share it somewhere, anywhere! My daughter, Beckie, has AD/HD. Now that she’s a teenager, her primary challenges are with the executive functions (EF) like planning, organization, and working memory. She also continues to need more prompts and external rewards than her peers without EF challenges. Beckie and her sister have been sharing a hair dryer for years. It is important to Beth, the older sister, to have the hair dryer put away after use. Beckie couldn’t care less if the hair dryer gets put away, so there is little internal motivation on her part to do so. Remember, anything that requires extra steps is not popular with our kids or adults with AD/HD. Additionally, they need more frequent rewards than their “neurotypical” peers. This need often extends into adulthood. I’ve come to realize that my husband needs that frequent positive reinforcement because making coffee and doing other chores is not intrinsically satisfying to him. He needs to know that his efforts are appreciated. Once I understood that, and realized that my son with AD/HD is the same way, I trained myself to make a point to express thanks for even mundane, everyday things. They need that. I can easily give them that. So when Beth made the comment about Skittles, I realized that Beckie was getting no reward when she remembered to put the hair dryer away. She honestly tried to remember, but since having the hair dryer put away was meaningless to her and she is highly distractible she often forgot. Since it wasn’t important to her in the first place, she experienced no internal satisfaction when she completed the task. I devised a simple plan to help Beckie be more successful, and hopefully end the hairdryer war or at least reach a truce. Knowing that she loves Tootsie Rolls, I bought a bag of miniature Tootsie Rolls and put them in a small bowl in the bathroom. I told Beckie that every time she remembered to put the hair dryer away, she could have one Tootsie Roll. Beckie thought it was a great idea. Now some of you are thinking, “Why should a teenager need a treat to do what she is supposed to do? Won’t that just keep her dependent on external rewards?” Good questions. Here’s what I think. By showing Beckie a simple way to motivate and reward herself, she is learning a strategy that she can eventually use on her own. Because her EF difficulties are likely to continue into adulthood, she absolutely needs to figure out ways to reward herself. Would it bother you as much if she were buying the Tootsie Rolls herself and using them as rewards for completing tasks? Probably not, because most of us do this in one form or another. I’m just showing Beckie an example of what she can do to keep herself motivated and on task. In the future, she will know how to do this for herself. Asking Beckie to try to remember to do a task that was not important to her just didn’t work. She meant to, intended to, sometimes did remember to, but not with adequate consistency. 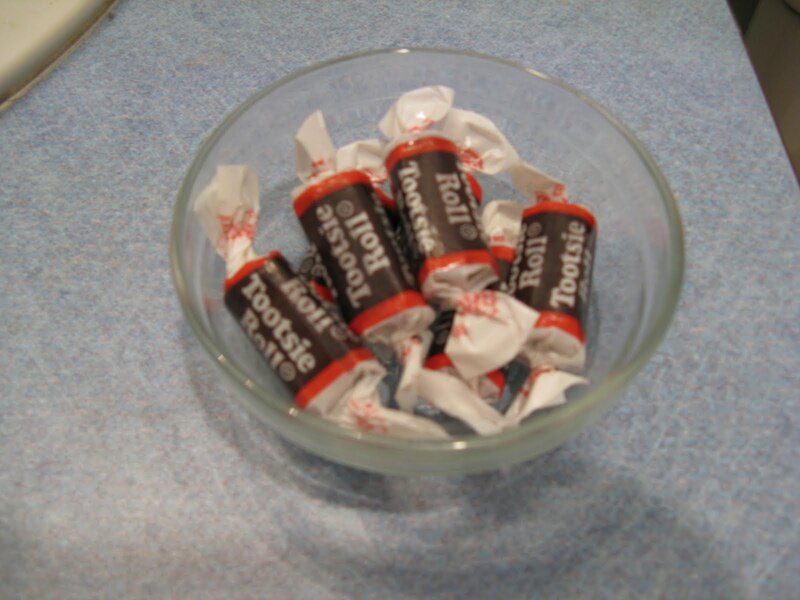 Now, every time she goes into the bathroom, she sees the little bowl of Tootsie Rolls. It is a visual reminder and incentive several times a day, even though she only dries her hair once a day. She is aware that one of those treats will be hers if she remembers to put the hair dryer away. Guess how many times she has forgotten to put it away since the Tootsie Roll plan has been in place? Zero! She has not forgotten to put that hair dryer away a single time, and it has been several weeks since we implemented the plan. Did this teenager benefit by an external reward system? The results would indicate an absolute YES! The hair dryer war seems to have ended peacefully, and Beckie has had great success while learning a strategy that will serve her throughout her life. She reports that she feels she has met the challenge, although she adds with a grin that once in a while she has forgotten to take a Tootsie Roll reward. Most of us have times when it’s hard to recall someone’s name, although we recognize the face. We readily admit, “I’m terrible with names” as a disclaimer when we first meet someone so he won’t be offended in the future if his name slips out of our grasp. This difficulty with name recall is both common and understandable. Unless an individual’s name makes it from our working memory into our long term memory, and pretty quickly, we are not likely to remember it in the future. For most of us, it is easier to recall the visual information and appearance of another person’s face than the auditory information of a name. Sometimes we recognize someone but can’t remember the context in which we met them. Church? Community activity? Friend of a friend? Because this is such a common experience, most people are pretty forgiving if we’ve forgotten the name but at least show recognition that we have met before. Often, there is mutual forgetfulness and the other person does not remember our names, either. No harm done. My son, Josh, has significant working memory challenges. I realized over time that my son not only was unable to recall names, neither could he readily recall faces. He had no difficulty recognizing those of us he interacted with on a regular basis, but for those he saw infrequently he honestly had no memory or context for knowing them. It would be unsettling for him when virtual strangers (to his mind) would call him by name and initiate a conversation. Josh has never been good at faking anything, so he would genuinely ask, “Do I know you?” or “I’m sorry, but have we met?” Unfortunately, this attempt to be polite and seek clarification had negative social implications. People naturally feel hurt when others don’t remember them, especially people whom they remember quite clearly and have shared past experiences. I remember a mother of one of my daughter’s friends coming up to me and telling me that Josh asked who she was and she told him “I’ve only known you for YEARS.” It was true, but months would go by in between each brief contact and Josh never transferred the information to his long-term memory so each contact was starting fresh – for him. If I told Josh who people were and when he had seen them before, it sometimes jogged a vague memory for him. There is a name for this “face blindness”, and the term is “prosopagnosia”. In severe cases, individuals have difficulty recognizing their own family members, friends, and even themselves. Many people with autism, PDD, and Asperger Syndrome experience prosopagnosia. I guess Josh had a fairly mild version, and I wondered if what registered in his mind’s eye was like a snapshot of faces, rather than the more dynamic version of faces changing to reflect a variety of emotions. Since Josh used to have difficulty recognizing different emotions expressed on faces, I thought maybe he only had one still picture in his mind and if it didn’t match what he saw there was no recall. I don’t know for sure, and Josh has improved over the years. It’s too bad that there’s not facial recognition software we could install in our brains to help us make the connections. I have worked with many children with autism who focus on part of something rather than seeing the whole. If this happens when a child looks at a face, he may see just the nose, or only the mouth, and not how those parts comprise a face. I have had children stare at an object I’ve held in front of my face, without recognizing that there was a person holding the object. If a face is viewed as individual component parts without seeing the whole, that face is not likely to be recognized in the future. For our verbal children with the language skills to express themselves, we can teach them strategies to ease the social tension. Having someone admit “I know lots of people have trouble remembering names, but I even have trouble remembering faces sometimes” may prepare others in advance so they won’t be offended or surprised when they have to reintroduce themselves. For our nonverbal or less verbal children, we can advocate for them by explaining the challenges of prosopagnosia and reassure others that it is not a personal slight when our children don’t acknowledge them with recognition. My hope is that when we explain that there is a neurological glitch, others will be more flexible and accepting and won’t misinterpret our struggling learner’s behaviors in a negative way. Having a child with special needs and learning struggles can put a strain on your budget. There are so many expenses with doctor’s visits, therapy, tutoring, specialists, and medications that the overall cost is overwhelming. As a speech/language pathologist and homeschooler, I could address some of my children’s needs on my own. I was a speech therapist before I became a mother, and felt blessed that I had an education background as I navigated the paths to finding help for my children’s struggles. It helped that I could do the speech therapy myself, but I still needed resources to help with the other diagnosis and treatment for identified areas of need. I relied heavily on input from my occupational therapy friends (thank you, Amy!) and had weekly visits to a psychologist for over three years. Actually, my child had the visits but there were times when I could have used more help for my own struggles as his mother! I took my two AD/HD children to social groups, parent-child programs, group activities, and more. There was a significant financial expense as well as a personal cost since I almost always had to be in fairly close proximity to help them be successful and to train and advocate with others who worked with them. My husband has always been supportive, but does not have the special needs background that I do and I was the one doing the homeschooling. As such, my husband just saw all the bills come in for all the interventions and programs we tried. We’ve never had money just to throw around and I wanted to be responsible with our family resources and have something to show for my efforts. Yet I’ll admit, even when I heard about treatments that sounded too good to be true, my heart still had a burst of hope wondering if it might actually be THE thing that changed our lives for the better. What kind of mom would I be if I didn’t at least give some consideration to something that might make a huge difference in my children’s lives and ease their struggles a bit? Some of the more outrageous proposals I was able to talk myself out of attempting, but there were others I explored more thoroughly. Some were rather expensive explorations with minimal or no returns, and I try not to think of what I could have done with that money had I not fallen for the marketing strategies and testimonials that sucked me in. Still, I have to say that as a parent desperate to find and do anything to help my children, I would have had more regrets had I not at least given some things a try. 1. Most medical professionals will work with you on financing. If you are self-employed or uninsured, sometimes they will agree to charge a lower rate than what the insurance companies are charged. Talk to the billing department and tell them how much you can afford to pay each month. If you are at least making monthly payments, you are much less likely to have your bill turned over to a collection agency. 2. Some agencies (like those with United Way) have sliding fee scales based on ability to pay. You have to share what your income is and how many are in your family and so on, but you may be able to afford therapy that otherwise would not be available to your child. 3. Check with your local school district, even if you are homeschooling, if you feel comfortable in doing so. Some schools will provide therapy and other supports even to homeschooled students. It varies from district to district, and I always recommend checking with Home School Legal Defense Association (www.HSLDA.org) prior to contacting your local school district. HSLDA members can speak with their region’s special needs coordinator for additional suggestions, including homeschool-friendly specialists and consultants in their area. 4. If you personally know someone who is trained in an area that your child needs help, think about an exchange of services. What do you have to barter with? I saw a friend’s child for speech therapy in exchange for her watching my children for a few hours now and then. It was worth it for both of us! More recently, I had two friends with sons in need of some speech therapy. I tried to persuade them to drive with my daughter (who has her permit and needs more hours of practice before getting her license) in exchange for speech therapy. They didn’t go for the idea, but because they were friends I saw their sons anyway. Try not to take advantage of your friend with professional training, but instead think of something that won’t bust your budget that you could offer in exchange for their professional expertise. They should be able to give you ideas and show you how to implement strategies at home. 5. I don’t have personal experience with this organization, but I came across this website some time back and thought it might be helpful for a family feeling buried under medical bills with ongoing expenses and no end in sight. It’s called “NeedyMeds” and has information on medicine and healthcare assistance programs. There is more information on the website www.NeedyMeds.org and if you are a low income family or are uninsured or under-insured this organization may be of help. Years ago I convinced my brother to go skiing with me. I had been skiing once prior to this, and I never made it off the easiest slope known as the “bunny hill”. The easier slopes provide a rope tow up the hill rather than the chair lifts used by more advanced skiers. I shared all my skiing knowledge with my brother, which took at least two minutes, then set him free to practice his new skills. As I was holding the rope tow on my way to the top of the slope again, I saw my brother about half way down the hill. As I watched, he wiped out and just flopped onto the ground. Then I noticed he wasn’t moving. In my mind, I became his rescuer. With my novice skiing skills, I pictured myself as a keg-toting Saint Bernard braving the winter cold to get to the victim of a mishap, but I was determined to reach my brother as quick as my wobbly legs and skis could carry me. I zoomed (only in my mind) down the hill toward him, and just as he managed to push himself into a crouching stand I plowed him over and took us both several feet further down the hill. Ta-dah! Have you ever been “helped” like that? Someone with good intentions directed your way but leaving you feeling bowled over? I’ve felt like that during some of my homeschooling challenges. I’ve met people who seem to find me normal enough until they find out I’m a homeschooler. At this point they helpfully question my competency and qualifications while providing me with an extensive list of topics that I must cover or my children will be permanent outcasts from educated society. This exchange concludes as I am trying to figure out which concern to respond to first and they slowly back away, shaking their heads and murmuring that they could NEVER homeschool their children. “I can’t either!” the small voice in my head replies. “What am I thinking?” Plowed over again. Other times the challenges come from my own homeschool students. I may think I have a lesson plan so exciting that even my struggling learners will flow right along with the lesson and beg for more. In my enthusiasm, I might be several minutes into an activity before I become fully aware of the blank stares of my children. Why, they actually look…(gasp!) bored with my incredibly thought out and creative lesson designed specifically to promote their love of learning. But they don’t love it! Plowed over again. When something or someone knocks you flat, get back up and don’t give up. Just as my brother cautiously got to his feet again and continued to conquer the “bunny hill” slope, and as I carefully avoided knocking him off the slope, you can’t let setbacks define you. A face plant in the snow is rough. Being re-planted by a circumstance or by someone “helping” you is also rough. But staying down is not the place to be. Rest a bit if you need to, before picking yourself up. Just don’t stay down so long that you get frostbite. No matter how many times it takes, get back up again. It will be so much better than remaining in a plowed over position. It will be worth it. I promise. My friend and colleague, Kathy Kuhl, has written an excellent book (Homeschooling Your Struggling Learner) that provides practical strategies for struggling learners as well as being a wealth of encouragement. Kuhl interviewed homeschooling families with children representing a variety of special needs such as autism, AD/HD, learning disabilities, and more. Many hours were spent interviewing, researching, and compiling information into this reader-friendly and very organized book. Kathy’s book is available at Heads Up by clicking on the “book” category on the web site. I had the pleasure of presenting with Kathy at a conference last October, and while we were there we grabbed a few minutes to do this interview. So here it is, the first “Kuhl and Boring” video presentation for your enjoyment! I’ve met many parents who are pretty sure their child has AD/HD or some other learning challenge but they are hesitant to make it official by having their child evaluated and diagnosed. The fear that a label may limit their child, be inaccurate, or be used in discriminatory ways is valid. When my son, Josh, was approaching school age I thought about the advantages of private schools with smaller class sizes. Several people suggested that I go ahead and enroll him without telling the school personnel about his AD/HD diagnosis so they couldn’t turn him down. That was before we knew he also had an auditory processing disorder. I was assured that once he was enrolled in the school, they couldn’t kick him out just because he had a diagnosis and they would be forced to work with him. Wow! For one thing, Josh was pretty easy to pick out of a group as being different than his peers. I’d give it 5 minutes tops before things became unavoidably noticeable. So basically I would have had to keep him out of sight until school had officially started. Then there was the whole idea of the people he would be spending hours with each day being tricked into having a student that they weren’t prepared for and apparently didn’t feel equipped to deal with in their classroom. That made me feel sorry for Josh and for the teachers, since having someone who was “forced” to work with my child because I had hidden some vital information from them just didn’t sit well with me. I loved that boy, and the thought of sending him somewhere that he might not be wanted didn’t make sense to me. I had the same dilemma when it came time for Sunday School at church. I didn’t want to bias the teachers against Josh by telling them all his struggles, so I coached him on the way there and dropped him off like all the other parents with their children. The Sunday School teachers, bless them all, are volunteers in the church and most don’t have training as educators – and for most kids that’s just fine. But to do the “drop and run” with a special needs or challenging child is not a good idea, as I came to realize. Every week, the other parents would pick up their children and happily leave. When I came to pick up Josh, I inevitably got pulled to the side and told, “I need to talk to you about Josh.” Then I heard, week after week, a full litany of complaints from frustrated and bewildered teachers who were describing things that were not unusual for Josh but were not typical for most children. For example, Josh was not adept at sitting still for long. He was not deliberately disruptive and was never disrespectful, but his need to stand at the table while coloring his page instead of sitting in a chair like everyone else was considered problematic. His sensory issues led him to sit at the back of the group on his carpet square, and everyone else was huddled together and bumping into each other which Josh was carefully trying to avoid. But that meant he wasn’t “with” the group because he had made a row of one – just himself! And the list would go on and on until I was finally allowed to leave with my miserable son who knew that somehow just by being who he was he had screwed up again and people were unhappy with him. Those experiences led me to advocate more and be preemptive with anyone I left Josh with for any length of time. When there was a sub or a new Sunday School teacher, I made a point of telling them a bit about Josh and strategies that would help them, and I was careful not to dwell on the negatives. I shared Josh’s strengths, too, for I found that if I became negative about my son others felt free to share every little thing they saw as being wrong or weird about him. I was well aware of Josh’s struggles and it served no purpose other than to discourage me when others felt the need to complain about him. All this, and he wasn’t even doing anything “bad” on purpose! When someone was going on and on about all the things Josh did or did not do, I learned to quietly point out something that he had done right, or I’d share something that Josh had enjoyed learning in their class previously. This seemed to derail some of the negativity some of the time. Just as with our kids, nothing works all of the time but something will work some of the time. We need strategies for working with those who are in a position to care for our children, and hope that something will work some of the time. Whether you are a natural advocate or a reluctant one, if you have a child with a learning difference or special challenges, you must be an advocate unless and until your child one day develops the skills to advocate for himself. In my experience, being deliberate in my advocacy was hard but preferable to what happened when I just waited and hoped things would work out for the best. When you are homeschooling a special needs or struggling child, you are not always on the same timeline as others. The curriculum you use needs to be adapted and usually one of the biggest modifications involves time. Our children with various challenges and differences do not develop at the same rate as those who are typically developing. They need more time to learn skills and retain information. They may mature more slowly and need additional practice and support to progress. My son could take two hours to do an assignment I thought should take twenty minutes, and it was the same way with chores. Other children have medical issues like seizures that can interfere with their ability to remember previously learned skills. They need to re-learn information, and that takes time and makes the rate of progress variable. So given those kinds of situations, how can we make the most of our time and be good stewards of that resource? One lesson I learned about my use of time was that I really needed to focus on my goals for each of my children. Once the goals were in the forefront of my mind, it was easier to eliminate things that were not conducive to helping achieve those goals. When everything is treated as being equally important, there is no priority and the important issues may get pushed aside by lesser matters. With my son, Josh, it became clear that he was not going to be able to do many different subjects in a single day and finish all of his work. Although he didn’t need as much sleep as I did in those early years, I didn’t want him spending all day and then the evening trying to get his schoolwork done, struggling all the while. I homeschool for many reasons, including helping my children develop a love for learning. Spending too many hours on school tasks seems like a good way to achieve burnout for all of us. My husband and I agreed to focus on the basics with Josh, and limit the amount of time spent on highly structured learning tasks. I had to pare down my long list of what I would like to do and instead think realistically about what I could do each school day. Because Josh and his sister, Beckie, had learning challenges I had to eliminate some of the supplemental material I had originally planned on and limit the work to the core essentials of their education. In addition to recognizing the best way to invest our time, we need to try to teach our children to make the most of their time. Many kids live in the moment, which is a perspective that has blessings of its own. Without losing that ability to fully experience life as it happens, we need to gently guide our children to consider future events and plan for them in a thoughtful manner. This does not come naturally for most children, and there may need to be consequences that occur as part of the learning process. Here is an example from the Boring family homeschool: I have a lesson planned and go over it with the kids. They start goofing around, are not working on their assignment even though they know what is expected and are capable of completing the work. I do not mind spending more time on a lesson if my children do not understand something. However, when it is clearly a matter of choice and they are choosing to be silly, they are wasting their time and mine and there will be consequences. I think that the children should experience the consequence of their poor decisions so that hopefully they will make better choices next time. With that goal in mind, we started “homeschool homework” when the children were wasting time. I would set a time limit for a certain assignment, and if they did not complete it within that period, they had homework with Dad when he got home. This kept them accountable to Dad, and kept them from more play time until their homework was done. This worked well for us since my husband did not have to plan or teach the lesson but could just follow-through with what I had assigned. Making the most of our time will be manifested differently for each of our families. We all have limitations and demands on our time. Finding balance, remembering our goals, and investing time in our children will allow us to experience the satisfaction of time well spent. When my son Josh was learning to read, it was an arduous process. He made steady progress, but had to work hard to remember the sounds represented by print and the various ways they blended into words. At the time I was teaching Josh to read, my next door neighbor had a daughter 11 months older than Josh. This little girl took books to bed with her at night, and basically taught herself to read as her mother read to her. Before long, and without any curriculum or structured lessons, this girl was reading independently. In the meantime, I struggled to stay awake after lunch when we did the reading lesson for the day. Sometimes it took Josh so long to decode a word that I’d start to nod off and Josh would ask if I was still awake. It didn’t help that Josh was also hyperactive, and it was not unusual for his head to be on the floor and his rear end up near the book. I decided instead of the “phonetic approach” I was teaching the “bun-etic approach” but it didn’t work very well as a way to teach reading! This was Josh and Beths’ kindergarten year, and besides the actual reading instruction I was reading over 100 books to them each month. We were regulars at the library, and if merely exposing them to reading and books could have taught them to read it sure should have happened. They enjoyed the books, but they in no way taught themselves to read. It took work. The books that motivated Josh to read on his own were from a series with titles that started with “Would You Survive…” as a squirrel, deer, fox. etc. These books featured various animals in their habitats, and at various points choices had to be made. For example, when faced with a predator, the reader gets to choose if the animal runs up a tree or hides in a hole in the ground. Based on the choice, the reader is instructed to go to a specific page to continue the story. In addition to teaching about the animals, the stories would have different outcomes depending on the choices the reader made. Josh, like most children with AD/HD, loved the versatility of a story that could be different each time he read it. These books really ignited Josh’s love of reading, and soon after he discovered the “Choose Your Own Adventure” series which also gave the reader options that influenced the outcome of the story. Finding books that connect with your child’s interest and imagination can make a huge difference in the attitude toward reading. The “Would You Survive” series helped Josh see that reading was not just another required task he had to perform for school, but was actually something that he could enjoy.